August is a prime time for sandwich making. Between picnics, beach parties, camping trips and back to school lunches, it’s certainly a fitting time of year to be chosen as National Sandwich Month. To honor this mouth-watering, month-long celebration, here’s a Tristar Products review on the invention of the sandwich. The combination of two pieces of bread with meat and/or cheese and dressings and condiments in between is nothing new. It is a recipe that has been enjoyed by many cultures over many generations. But food historians typically attribute that invention of the modern-day sandwich to the 4th Earl of Sandwich, John Montagu, in 1762. The story behind Montagu’s creation is an interesting one. The Englishman was an avid gambler and during a 24-hour gambling binge he instructed his cook to make him some food that he’d be able to eat without interrupting his game. So maybe Montagu’s cook should be the one who gets most of the credit, but we digress. What he produced was sliced meat between two pieces of toast. This meal that required no utensils and that could be eaten with one hand, allowing Montagu to continue his game, is considered the world’s first sandwich. Recipes for sandwiches immediately caught on in England and became a regular restaurant item in no time. However, it took some time for this culinary breakthrough to gain popularity in the newly colonized United States. Early American cooks most likely still made sandwiches, but there is very little recorded evidence of this due to the fact that Americans didn’t very much like things that still connected them with England. It took some time, but Americans did eventually end up calling their bread and meat combinations sandwiches by the 1830s. 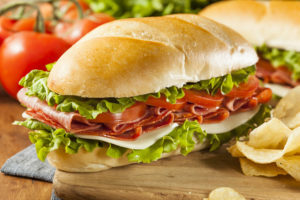 But one way the United Stated differentiated their sandwiches from that of England was the proliferation of ham as the primary meat instead of beef.